Some thirty hours after leaving home, we arrive at the Pousada Currupira D’Araras in time to join the fishes for a well earned cool soak in the stream-fed pool, while watching White-winged and Southern Rough-winged Swallows, Rufous Hornero and Rusty-margined Flycatcher. There are plenty of birds around this lovely lodge such as Cattle Egret, Buff-necked Ibis, American Kestrel, Southern Lapwing, Scaled Dove, Red-shouldered Macaw, Golden-chevroned Parakeet, Guira Cuckoo, Chalk-browed Mockingbird, Magpie Tanager, Greyish Saltator and Chopi Blackbird. Later this afternoon we visit a lake not far from the lodge, where new sightings include Great and Snowy Egrets, Striated and Capped Herons, a fabulous Rufescent Tiger-Heron, a single Muscovy Duck amongst a flock of White-faced Whistling-Ducks, plus Brazilian Teal, Grey-necked Wood-Rail, Common Gallinule (Moorhen), Wattled Jacana, Black-necked Stilt, Picazuro Pigeon, Ruddy Ground-Dove, Blue-headed Parrot, Smooth-billed Ani, Amazon Kingfisher, Black-backed Water-Tyrant, Great Kiskadee, Purplish Jay, Silver-beaked and White-lined Tanagers and a ‘dayglow’ Orange-backed Troupial, although a pair of Barred Antshrikes displaying at close range with erected crests are the headline act. All this within just half an hour! Beyond the pool further sightings include our first of many Roadside Hawks plus White Woodpecker, Southern Screamer and a fast flying Bat Falcon. As the daylight quickly fades, Venus and Jupiter are in juxtaposition, and in the scope the bands of Jupiter are clearly visible along with four of its moons! On the drive back to the lodge, several Common Pauraques are caught in the headlights while sitting on the dirt track. Roll on tomorrow and a whole load more magical birds. After a 4.30am breakfast we set off at 5.10am still in darkness, and as the light improves the first sighting is of a couple of Crab-eating Foxes crossing the track ahead of the vehicle. The landscape is a sea of grass dotted with numerous termite mounds and ‘islands’ of forest, inhabited by noisy Orange-winged Amazons, a pair of handsome Whistling Herons and a pair of awesome Crowned Eagles, all perched in isolated tree tops. More fabulous birds quickly follow such as Savanna Hawk, Yellow-headed and Southern-crested Caracaras, Aplomado and Laughing Falcons, Burrowing Owl, Campo Flicker, Vermillion Flycatcher, Black-throated Saltator, Grassland Sparrow, Grey Monjita, with ruby red eyes, Cuvier’s Toucan and the Toco Toucan with an incredibly massive yellow bill, and it’s still only 7.40am! Enter a pair of fly by Blue-and-yellow Macaws, which circle our heads twice while calling raucously! What an amazing show. Next we come to a rickety old wooden bridge over the Rio Pary which is jam-packed with stunning bird action; Common Tody-Flycatcher, Blue-tufted Starthroat, Gilded Sapphire, Wedge-tailed Grass-Finch, Yellow-tufted Woodpecker, Little Cuckoo, Straight-billed Woodcreeper, Red-billed Scythebill, Black-tailed Trogon, Rufous-browed Peppershrike, Masked Tityra, Buff-breasted Wren, Turquoise Tanager and Yellow-billed Cardinal all make brief appearances, while a group of Black-fronted Nunbirds, a pair of Black-crowned Tityras and two Brown Jacamars with lance-like bills all pose in the scope, while a Greater Yellow-headed Vulture cruises lazily overhead and a pair of Thrush-like Wrens are busy building a nest above the bridge. There is so much happening it is hard to keep pace with the stream of new sightings! On the drive back to the lodge a Red-winged Tinamou darts across the track and we enjoy good views of Saffron Finch, the flightless Greater Rhea and a couple of King Vultures perched majestically in a tree, in addition to plenty of soaring Black and Southern Turkey Vultures. That’s a full ‘working day’ by lunchtime! This afternoon we enjoy a leisurely exploration of the local forest around a currently unoccupied Harpy Eagle nest, where a small pool is home to a family of Least Grebes, the forest houses Scaled Pigeon, Dusky-headed Parakeet, Lettered Aracari, Boat-billed Flycatcher, Epaulette Oriole, and a superb White-eared Puffbird, while a couple of White-tailed Hawks hang like kites above the wooded ridge. Try picking a star bird out of that lot! It’s cool and cloudy first thing when we set off into the forest near the lodge, where early birds include Green-barred and Little Woodpeckers, Squirrel Cuckoo, Grey Hawk, Swallow-winged Puffbird, Short-crested Flycatcher and better views of Scaled Pigeons, along with plenty of Palm and Sayaca Tanagers. Meanwhile a Lettered Aracari shows but quickly disappears to be replaced by a Chestnut-eared Aracari, which poses for knockout views, before we move on for Green Ibis, Green Kingfisher, Black-capped Donacobius and Pied Plover by the ‘lodge lake’. After lunch back at the lodge, we have to leave this lovely setting and a Crimson-crested Woodpecker drops in on a tree behind the lodge as we say farewell. After a long bumpy journey we arrive in the Pantanal flood plain where the tar road becomes a dirt track and the first Hyacinth Macaws make an imposing appearance, along with a roadside Limpkin and several Toco Toucans. Leaving the Transpantaneira road, a Rufescent Tiger-Heron poses on a fence post at the entrance to the Piuval Lodge, where a short stroll along the drive produces an absolute feast of birds including Plumbeous and Buff-necked Ibises, Cocoi and Striated Herons, Roseate Spoonbill, American Wood Stork, Snail Kite, Great Black Hawk, Chaco Chachalaca, Picazuro Pigeon, Hyacinth Macaw, Peach-fronted Parakeet, Gilded Sapphire, Ringed Kingfisher, Toco Toucan, Green-barred Woodpecker, Tropical Kingbird, Vermillion Flycatcher, Crested Oropendola and the mighty Jabiru, and then at 5.05pm precisely, five Campo Flickers land on one small dead tree, to be joined by a pair of Turquoise-fronted Amazons, creating a fabulous scene in the scope. As the light begins to fade, waves of Bare-faced Ibises fly over on their way to roost while a flock of thirty plus Nacunda Nighthawks are on their way to begin the night shift. What an amazing place this is, especially if it’s your birthday! Next morning there are birds in every direction around this fabulous lodge, with plenty of Cattle Tyrants, Rufous-bellied Thrushes, Saffron Finches, Chopi Blackbirds and Bay-winged, Shiny and Giant Cowbirds at close range. Other sightings here include White-faced Ibis, Lesser Yellow-headed Vulture, Peach-fronted Parakeet and a posing pair of Hyacinth Macaws, followed by a White-rumped Monjita on one of the many termite mounds as we rejoin the dirt road. 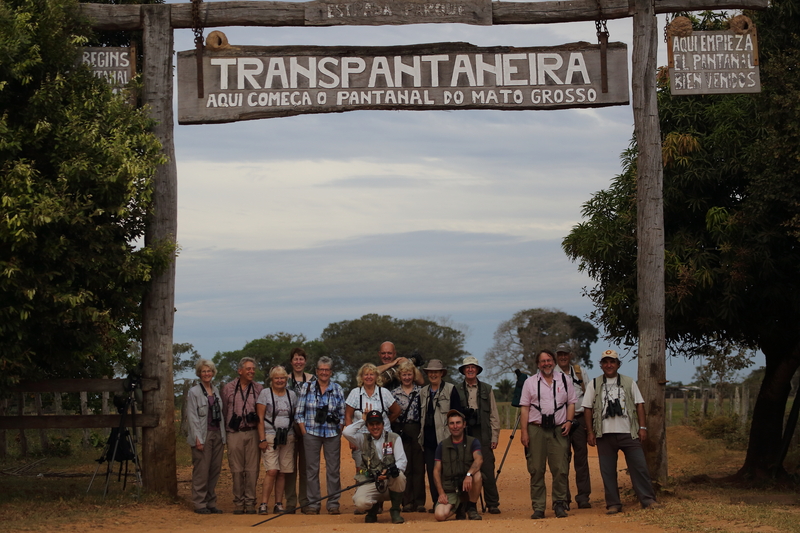 A wooden Transpantaneira sign across the road is a good place for a group photo as well as for good views of Black-crowned Night-Heron, Black-bellied Whistling-Duck, Black-collared Hawk and Black-backed Water-Tyrant. Bumping along the road via 129 rickety wooden bridges, with planks that move and shake as the tyres roll over them, we pass hundreds of Limpkins, Snail Kites and assorted storks, herons and egrets, along with Olivaceous Cormorants and Anhingas, until a break for elevenses with Monk Parakeets, and then both male and female Bare-faced Currasows right beside the ‘road’. This afternoon is mainly for driving, with Crane Hawk, Long-winged Harrier, Chotoy Spinetail and Scarlet-headed and Unicoloured Blackbirds along the way, until we break the journey for a Great Potoo, ‘glued’ to the end of a branch. The view in the scope reveals every feather detail, while the appearance of Scaly-headed Parrot and Golden-collared Macaw are a nice bonus here, and the derelict shed is home to a group of roosting Siba’s Fruit Bats. Last stop is for a Great Horned Owl, as well as Picui Ground-Dove and Masked Gnatcatcher, and we arrive at the Porto Jofre Hotel in time for the arrival of Hyacinth Macaws, coming in to roost in the palm trees right above our heads! 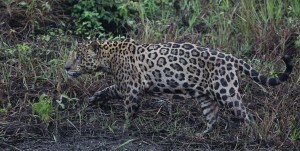 Today is ‘Operation Jaguar’ and so we set off upstream along the Cuiaba river. After barely five minutes afloat, our boat is approached by a trio of Giant River Otters, and one of the youngsters is so inquisitive it swims to within stroking distance, and virtually pops its head over the side of the boat for a closer look at us! Further upstream we find Large-billed and Yellow-billed Terns alongside bizarre Black Skimmers, plus a tree full of Blue-throated Piping-Guans, Chestnut-bellied Guans, Toco Toucans and Brown Capuchin Monkeys. Next we find Black-and-gold Howler Monkeys with a Blue-crowned Trogon in the same tree, when suddenly the views are cut short by news on the radio of a Jaguar sighting. After a high speed dash with the boat tilting sideways on each tight bend in the river, we are cruising slowly along a narrow channel, where we find the ‘big old boy’, much bulkier than any Leopard, slowly working his way along the bank, without even giving us a second glance as we follow him for several minutes, while taking plenty of footage of this fabulous wildlife encounter. On the way back to the hotel, back in birding mode, we spot Blue-crowned Parakeet, White-headed Marsh-Tyrant, ‘chinless’ Yellow-chinned Spinetails and a single Solitary Black Cacique. After lunch we are off again in search of more Jaguars! At 3pm the call “Jaguar, Jaguar” comes in on the radio and it’s full speed ahead again! By the time we reach the scene other boats are turning back and it seems we are too late. After a short wait in the tranquil channel our prize is relocated. This time it’s a mother and cub providing another fantastic wildlife show and at one point a Neotropic Otter also shows in front of the Jaguars, while the Boat-billed Herons roosting in the bushes above the elegant big cats get just a cursory glance! 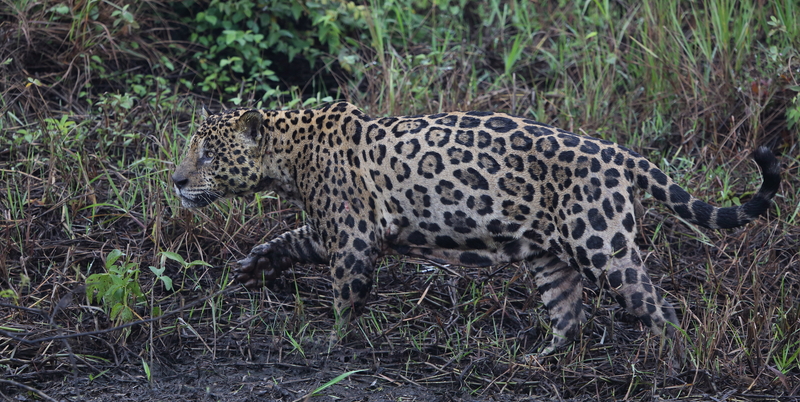 Given the size of the area and the dense vegetation along the waterways, brilliant sightings of three Jaguars in one day is a remarkable achievement, and all thanks to the skill of the boatmen. The cool cloudy weather continues this morning as we begin with a frenzy of activity around a bird table in the hotel garden, where sightings include White-tipped Dove, Golden-chevroned Parakeet, Turquoise-fronted Amazon, Great Kiskadee, Purplish Jay, Palm Tanager, Yellow-billed Cardinal, Greyish Saltator, Orange-backed Troupial and House Sparrow! Next we set off on a stroll along the dirt road that links the Port Jofre Hotel to the outside world. Along the road, there are plenty of pug marks left by Jaguars, smaller cats and deer, along with a steady stream of birds such as Grey-fronted Dove, White-lored Spinetail, Great Antshrike, Rufous-tailed Jacamar, Fawn-breasted Wren, Plain Antvireo, Yellow-rumped Cacique, Mato Grosso Antbird, Southern Beardless Tyrannulet, Masked Gnatcatcher, Ashy-headed Greenlet, Pale-legged Hornero, Blue-crowned Trogon, Rusty-fronted Tody-Flycatcher, Buff-throated Woodcreeper, Grey-crested Cachalote, Shiny Cowbird and better views of the incredible Red-billed Scythebill. 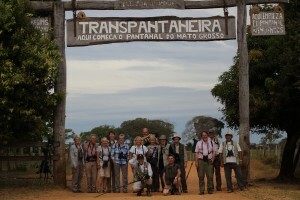 Sadly it is time to leave Porto Jofre and retrace our route along the Transpantaneira back to the Pantanal Mato Grosso Hotel for an afternoon boat ride on the adjacent Pixaim river, with its tame Jabiru and Black-collared Hawk which regularly swoops down for fishy titbits. As well as many of the usual waterside birds, we spot Lesser Kiskadee and enjoy close views of two downy Rufescent Tiger-Heron chicks sitting dead-still in the nest like statues, in the hope that we haven’t seen them! Another highlight is a Sungrebe swimming close to the boat, and the grand finale is a fabulous view of a Sunbittern calling from the water’s edge. After dark we go for a pre-dinner night drive, but with nothing to see until back at the hotel, where a couple of Crab-eating Foxes are sitting on the lawn right outside our rooms! A cloudless blue sky at last! First thing, the hotel feeders are alive with birds including a fabulous trio of flamboyant Chestnut-headed Aracaris perching like decorations on a Christmas tree. We set off at 7am for a boat trip along the river and soon find another Sungrebe, this time perched quite high above the water, along with several large Iguanas. Back at the hotel several Grey-breasted Martins are relaxing by the pool, while we set off for a walk through the riverine forest, spotting Flavescent Warbler, Ferruginous Pygmy-Owl, White-wedged Piculet, White-lored Spinetail, a showy male Band-tailed Antbird, a vociferous pair of Large-billed Antwrens and a stunning male Helmeted Manakin. Next it’s off to the Campo Largo ranch where we spot Long-tailed Ground-Dove and White-tailed Hawk, and a snake in the kitchen cupboard, followed by a delicious barbecue lunch! After a swim in the pool back at the hotel, we set off on another boat trip along the tranquil Pixaim river, where the ‘usual suspects’ plus the Sunbittern are joined by Little Blue Heron and a vocal family of five Giant River Otters which put on a great show right next to the boat! As the daylight fades, Venus, Jupiter and the Southern Cross appear along with large fishing bats and Nacunda and Band-tailed Nighthawks; a magical end to another memorable day. The sunny weather continues as we retrace our route north out of the Pantanal, with Marsh Deer, Ferruginous Pygmy- Owl, Greater Thornbird, Screaming Cowbird and a band of rufous Coatis along the way. Back at Piuval Lodge an open truck drive on the ranch produces nice close views of Plumbeous and Bare-faced Ibises and a large rare Caiman Lizard moving slowly through the water, right beside the track. Once in the forest, we disembark the truck for a stroll and find Yellow-olive and Swainson’s Flycatchers, Pearly-vented Tody-Tyrant, Masked Gnatcatcher, Moustached Wren, Rufous Casiornis, Grey-headed Tanager and a pair of Chestnut-vented Conebills. Next it’s a boat ride through rafts of Water Hyacinths, teeming with Caiman, Striated Herons, Wattled Jacanas and Black-capped Donacobiuses, as well as a couple of Southern Screamers and another Sunbittern. After lunch at the lodge we continue north through Cuiaba to an impressive line of cliffs where Cliff Flycatchers do exactly what it says on the tin! Beyond the cliffs we reach the ‘tablelands’ home to Pale-vented Pigeon, White-tailed Goldenthroat, Yellow-bellied Elaenia, Chapada Flycatcher, Black-faced, White-rumped and Hepatic Tanagers, a very showy Rufous-winged Antshrike, and a Burrowing Owl with a burrow right next to the road not far from the hotel! Further exploration of the local area, which has the Goedesic centre of South America with a very modest concrete ‘monument’, and a plunging waterfall called the Bridal Veil, produces an array of good birds such as Red-legged Seriema, Peach-fronted Parakeet, Scaled Dove, Ruddy Ground-Dove, Swallow-tailed Hummingbird, Glittering-bellied Emerald, Pale-breasted Thrush, Southern Beardless Tyrannulet, Vermillion Flycatcher, Southern House Wren, Violaceous Euphonia, Swallow Tanager, Chopi Blackbird, Red-pileated Finch, Plumbeous Seedeater and Rufous-collared Sparrow. On our last full day in the local woods, we are still adding new birds to the trip list such as White-bellied Warbler, Syristes, White-shouldered Tanager and Green-winged Saltator, along with brilliant views of a very obliging tail-swinging Blue-crowned Motmot. Further along the same track we find Fork-tailed Woodnymph, Crested Becard, Bananaquit, a dazzling male Band-tailed Manakin and a White-vented Violetear which poses for a photo-shoot with ear tufts glittering like amethysts. This afternoon another wooded track produces Red-and-green Macaw, Purple-throated Euphonia, male and female Blue Dacnis, and for a lucky few, Tataupa Tinamou and a male Fiery-capped Manakin. It’s our last day in the field and we are still finding new birds like White-eyed Parakeet, Rusty-backed Antwren, Pale-breasted Spinetail, White-banded Tanager and Blue-black Grassquit, along with three Campo Flickers clinging to the top of a concrete telegraph pole. After an all you can eat meat feast lunch we drop by at Paulo’s back garden not far from Cuiaba airport for Double-collared Seedeaters among a flock of Chopi Blackbirds. By now the group had seen 263 different species of birds and enjoyed unforgettable close encounters with Giant River Otters and magnificent sightings of three Jaguars; so mission accomplished!